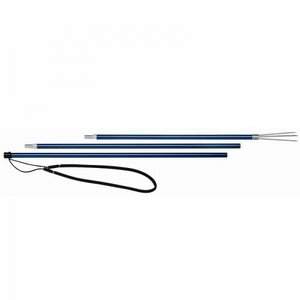 IST Sports pole spears are easy to use and each comes with a 5-prong paralyser tip. Simply connect each segment and the tip together and you are ready to fish! Each pole can be broken down for travelling or storage purpose. If you're looking for the best in a spear gun, this is it. Mahogany wood has a high strength factor compared to its weight and is very durable. All A.B. Biller spearguns are hand made. The mahogany wood receives 3 coats of polyurethane to protect it from environmental influences. 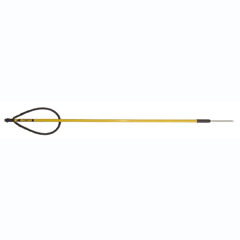 Mahogany spearguns come with a SS spinner rock tip attached to a SS 3 band shaft (2 band under 42"), with 2 5/8" slings, and a heavy duty rubber shock cord. 60" gun available by special order only. AB Biller economy stainless steel spear point. 061-S single barb rockpoint. 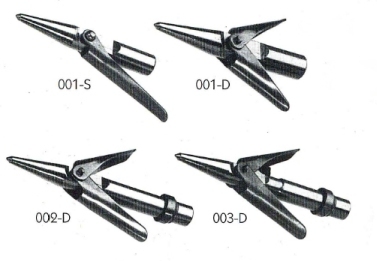 Nickel plated hardened steel spear points with stainless steel barbs and pins. Economical choice that gets the job done! This Reel is made to fit just about any wood spear gun. Made of rugged Plastic, it features line lock and ambidextrous mounting. AB Biller travel pole spear breaks down into 3 sections of 2 feet. Also available is a 4.5 foot version made up of three 18-inch sections. Available with a variety of tip options (see pull-down menu). 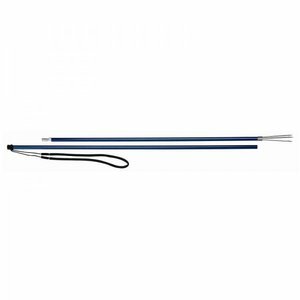 A-Plus Marine Supply pole spears are 5 to 6.5 ft long and constructed of lightweight fiberglass. Available with various tips that are permanently attached to the spear except for the spear with the threaded PAL adapter. 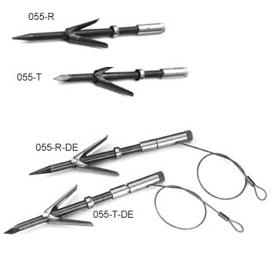 Choose the PAL adapter option if you have speargun tips (female end) that you would like to use with the pole spear, or to use with A & S bangsticks (see bangstick section). This metal fish stringer is made to last. features a highly visible, rubber coated grip. 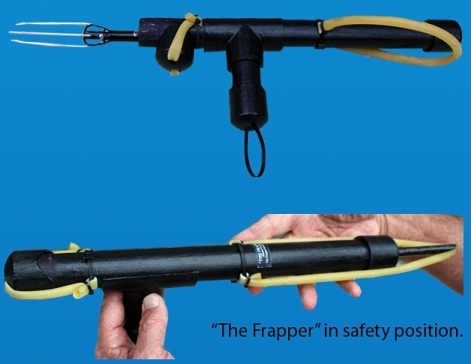 The Frapper(Patent Pending) is a very unique device specifically designed to aid in the control of the invasive species, the Lionfish (Pterois volitans). The Lionfish has become established in the Atlantic and Caribbean regions and continues to grow in numbers at an alarming rate. We agree that local control efforts CAN make a difference! Divers can actually strap The Frapper to a leg or clip to a buoyancy compensation device leaving the diver hands free to perform other tasks. Measures apprx 20" long and weighs less than 1 lb. To use, unfasten the front cap and you are ready to go. Before heading out on your next dive, read-up on this subject - www.reef.org and www.noaa.gov. Both of these sites have an abundant amount of information on this ongoing problem along with sighting report forms to be used at the time of a sighting. The ability to hide and break-apart their profile provides the Ambush attacker the upper-hand on unsuspecting targets. 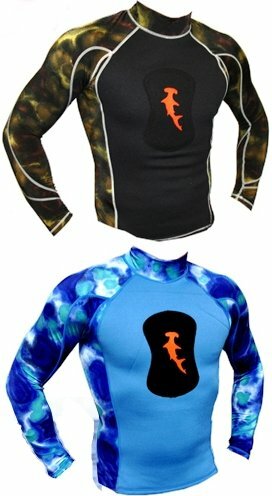 HammerHead Ambush 1mm Rashguards will blend you into the marine environment allowing you, the attacker, an opportunity to stalk and approach unsuspecting prey. Predator designed with a full-sized chest loading pad the HammerHead Ambush 1mm Rashguard can be worn singly as a warm water spearfishing top or worn over any wetsuit for an instant cammo-out. Constructed with a 1 mm neoprene chest and back to reduce evaporative cooling, oversized loading pad, and long sleeve 30+ SPF UV protective lycra arms for sun and jellyfish protection utilizing the Deep Reef Camouflage Pattern. Hawiian Handles, used with a free shaft spear. Best way to get larger fish without a Speargun. Hawaiian sling shafts have a single barb attached. Spring stainless steel or cold-rolled steel. Measuring 6 Feet, this is JBL's most compact travel pole spear. Three piece travel pole spear featuring 846 barbed paralyzer, 825 point, travel case, and precision machined unions for seamless fit. The Carbine is made of 1 inch clear anodized aluminium and comes with 2 slings. It is ideal for the beginner spearfisher. The Carbine Series spearguns are a great all-purpose gun for small to large game. The Carbine Series spearguns are a great all-purpose gun for small to large game. JBL's two piece pole spear measures 6 feet 8 inches. Breaks down into 2 pieces for easy travel and features 846 barbed paralyzer, travel case, and precision machined unions for seamless fit. Powerband speargun with 28mm barrel in black anodized aluminum. Mono-component powerband in pure cold-cast natural latex 16mm in diameter. 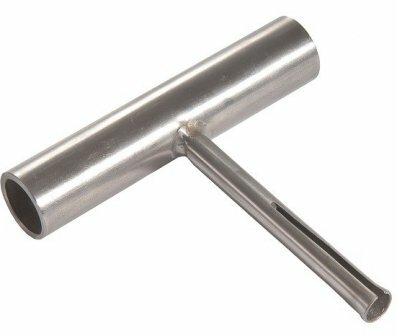 Tempered stainless steel shaft, single-tip, 6.25-mm diameter. Loading pad in two different sizes. 2-mm nylon standard. Wishbone: articulated. The Mares PHANTOM speargun is the result of years of continuing evolution and development of new materials and technologies for improving performance, safety and reliability. It is the maximum expression of Maresâ€™s extensive experience in the spear fishing sector. 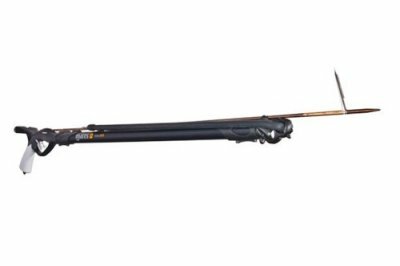 Single-piece speargun, with an interchangeable nylon reinforced muzzle. Vibration absorbing materials make the gun silent, both when shooting and when maneuvering. The cuttle-bone barrel and integrated shaft guide offer better accuracy than previous designs. A specific design for every barrel length ensures perfect buoyancy, optimum stability, and easy aim. Sold standard with two different interchangeable muzzles for circular powerbands and supporting fork for double powerbands. The muzzles feature broad grooves to make it easier to place the line, and they can be personalized with special buoyancy regulators. The highly-sensitive stainless steel release mechanism is also suitable for use with strong double powerbands. The mechanical line-releaser can be used on the left or right. The handle and chest pad are both made of soft touch anti-slip material. The accessory reel, attached at an angle, increases hydrodynamics, preventing any risk of snagging along the bottom. Tempered stainless steel shaft, single-tip, 6.5-mm diameter. Advanced performance dual-component 19-mm powerband. Mares Pure Instinct Spiro 87 Reel For Phantom Guns Reel created for Phantom spearguns, but can also be used on all 28-mm barrels with accessory adapter. The 87-mm and 65-mm coils are optimized and honed in thickness to increase capacity and lightness while maintaining excellent resistance. 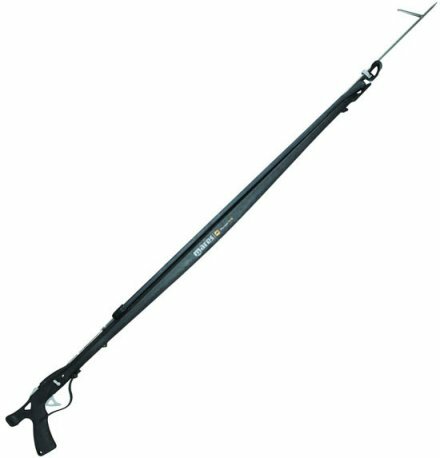 On Phantom spearguns, the reel can be used in the standard position or angled. Mares patented clutch. With the same technical qualities of SPIRO87 but with a 65 mm reel to increase the technical speargunâ€™s handyness when fishing among waves without giving up an essential thecnical support equipment. New reel for Phantom speargun. It can be used on all Instinct spearguns and all other 28 mm barrel guns with Reel adapter. The 65 mm reel has been improved and itâ€™s thicknesses reduced to increase capacity and lightness, mantaining its great resistance. 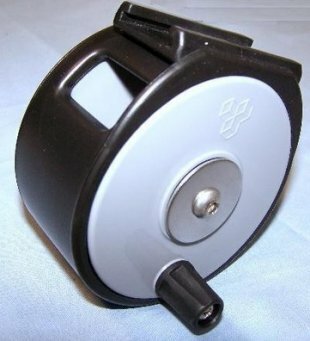 The reel can be used on standard or slant position. 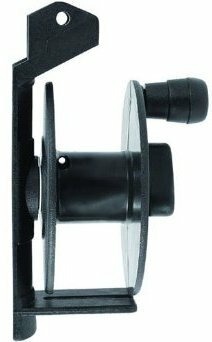 The Spiro Reel Adapter from Mares easily adapts the Spiro 87 and 65 reels to be used with all round barrel spearguns with a 28mm diameter. If you want to shoot big fish you need a reel. A large fish can pull your spear gun right out of your hand when it gets shot. The fish will begin to sound and when it does the fishes strength can take you for a ride. 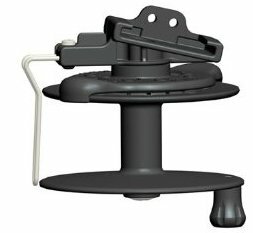 If you are not on Scuba this could become a problem very fast without a reel.Mares reel is rugged, simple, easy to use and, most importantly, reliable. Constructed from re-enforced polymers to retain its full strength over time, with a capacity of 164' (50 meters) of 1/16" (1.5 mm) line you can let the fish run with the line until it is tired. The all-new (patented) tensioning system permits quick and easy adjustments, without having to move the hand from the spear gun handle. The reel is supplied with an adapter that makes it possible to be used on any 1" (28 mm) diameter barrel. The Mares Sten spearguns are known and appreciated by all spearfishing enthusiasts for their characteristics of precision, power and reliability. The Sten is one of the finest pneumatic spearguns on the market, optimized for superior performance in a wide variety of spearfishing conditions. Choose from several sizes available. The Torpedo Buoy from Mares Pure Instinct range is designed to be used for freediving and spearfishing. 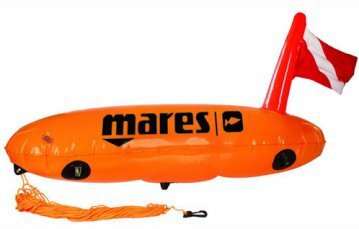 This marker buoy has been constructed from a heavy duty PVC for great durability and is supplied with a 20 metre line and karabiner. The Torpedo, as its name suggests has a streamlined aerodynamic shape for moving easily and comes with a hook for securing spearguns when not in use. A separate compartment can be filled to stabilise the buoy if there are high winds whilst freediving. 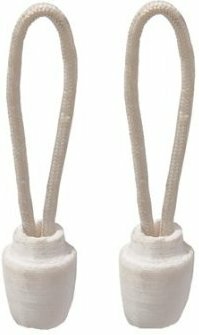 Mares Pure Instinct Wishbone Speed 2 (each) Connector end made of special 2 mm Dyneema line, designed for shafts with specially polished notches or pins. 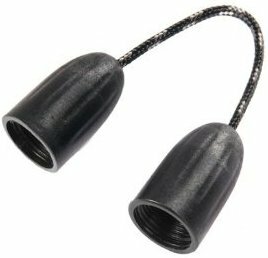 Mares Pure Instinct Wishbone Speed 3 (each) Connector end made of special 2-mm Dyneema line, designed for shafts with specially polished notches or pin.